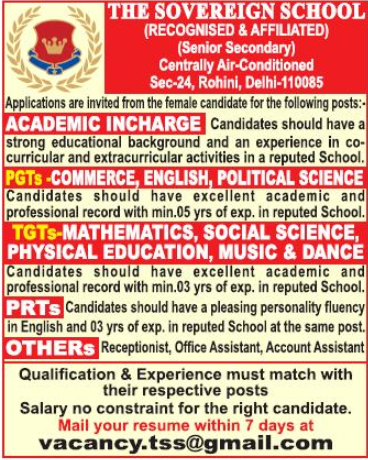 The Sovereign School, New Delhi has advertised in THE HINDUSTAN TIMES newspaper for the recruitment of PGT plus TGT jobs vacancies. Interested and eligible job aspirants are requested to apply with in 7 days. Check out further more details below. About School: The Sovereign School was established under the aegis of Rohini Eductional Society as an endeavour to create a safe, nurturing environment where children thrive & grow. It is a co-educational institution (Recognized & Affiliated by C.B.S.E.) imparting distinctive educational upbringing that enables young minds to grow not only in intellectual capacities but to bloom in other dimensions too. In a nutshell, The Sovereign School is a “Playground of Education” which provides a vibrant and fun-filled learning experience for children.